Last Thursday, I experienced the best party of my life. There was wine and beer, passed appetizers for days, and a hot pink tower of desserts. A live band reminiscent of Earth Wind and Fire belted out tunes with backup singers in sparkling dresses. People danced. People laughed. People stuffed their faces. And can you believe all this happened at The Container Store??? I apologize to whoever purchases this container. I may have smeared some of my short rib sandwich on it. Yes, it’s true. With the exception of a few wild frat parties in college and the time I drank too much Veuve and went fishing at 3 a.m. on Palm Beach, the biggest and baddest celebration I have EVER attended happened on a Thursday at Palm Beach Garden’s new Container Store in Legacy Place. First, the cash wrap was turned into a bar. A BAR. They served up prosecco, white wine, Funky Buddha beer, and Onli sodas. Or a cutie-patootie like this guy brought you your wine on a tray. Sure, I’ll take one of those! Second, there was food. And not just your usual pigs in a blanket cocktail weenies. REAL FOOD. The Florida food display of ceviche and seafood dishes. Delicious fried mac n’ cheese just waiting for someone to come along and take a bite. I don’t even know what these are but I want one. And, in case you didn’t notice, all the munchies were served in containers you can purchase AT THE CONTAINER STORE! Genius. Seriously, steal this idea for your next party. Veggies served up in plastic storage jars with mini spoons. Chinese food served in Chinese takeout cartons in a pull-out storage bin stand. And, the mother of all food displays: THE DESSERT TOWER. I just can’t handle it. Can I get one of these in my house??? Strawberry mousse in spice containers topped with fresh strawberries. Strawberry cupcakes with key lime and vanilla frosting and a sprinkling of what I believe is peanut brittle. You can’t have just one. And yes, JUP Mama and I did other things besides just eat. We listened to the band. And we checked out all manner of containers. JUP Mama rejoiced at the selection of baked goods gift packaging options. They had two walls of food storage containers. If you know me (or my family) you know that we can’t get enough of non-disposable, BPA-free plastic food storage containers. My VERY favorite section of the store: desk and office supplies. Check out the bicycle and mustache paper clips! My new business card looking very cute in this acrylic card holder. I might just have to pop back in and get one of these. I bet you had no idea that you can purchase packing supplies at The Container Store. Help yourself! “Uncontainable,” the story of The Container Stores’ success in creating the storage and organization retail industry using Conscious Capitalism, written by Chairman and CEO Kip Tindell. I may have to pick this up for some light reading. Even better, during the Grand Opening Weekend of August 27th – 28th, 10% of all sales were donated to the Maltz Jupiter Theatre, Florida’s largest nonprofit award-winning regional theater. Happy shopping, organizing, and containing! 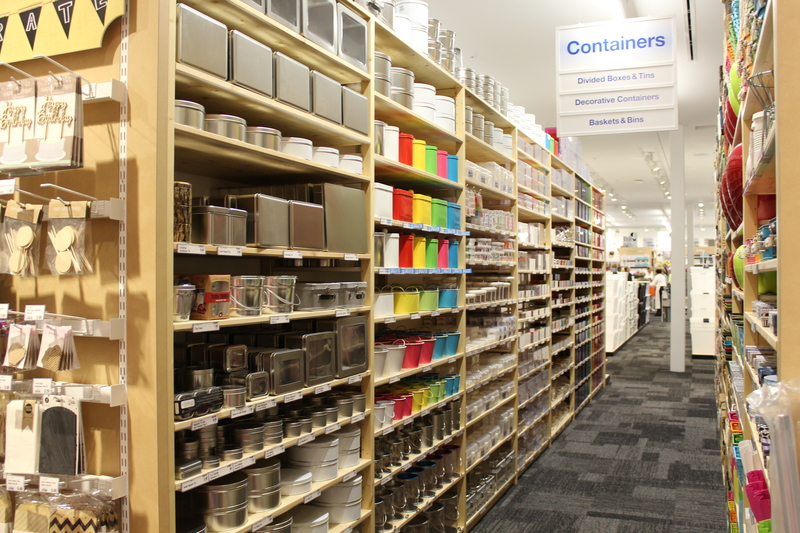 Visit The Container Store at 11201 Legacy Avenue, Palm Beach Gardens, Florida. Next DOGABUNGA!!! It’s the 2nd Annual Hang 20 Surf Dog Classic! Tell me about it – I wanted one of everything in the store! Jup Girl can’t wait to visit with you and P! Wooo, this looks like my kind of party 😉 I mean dessert tower?!! !